Happy New Year!! I hope you all had a wonderful 2011. Ours was very exciting – we traveled to some interesting places, got engaged, and moved to Somerville, MA. Whew! 2012 promises to be a fun one as well. We wish you all happiness, health, and delicious food!! 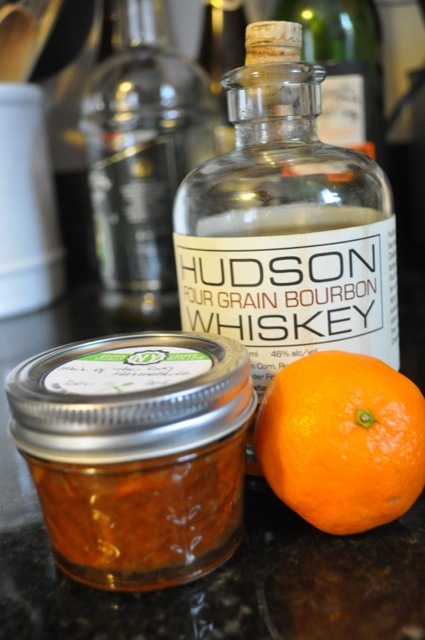 After last night’s festivities, you might want to top your burnt toast with this marmalade full of vitamin C and fructose and just a tiny bit of whiskey. Once you slice up all the clementines, it comes together pretty quickly. If you don’t process it, you can have it ready in about an hour. It’s got a nice bittersweet flavor that would work well with rich food, if you get sick of toast – a glaze for salmon or maybe in a grilled cheese sandwich.